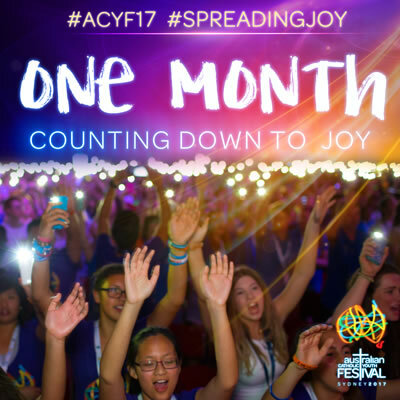 With only a month to go, Sydney is gearing up to play host to more than 18,000 young Catholics from around the nation for the Australian Catholic Youth Festival. The 3-day event of concerts, workshops, social events, forums and worship at Sydney’s Olympic Park from 7-9 December boasts a stellar line up of international and home-grown presenters and performers including world renowned Canadian Christian singer and headline act, Matt Maher. Festivities will conclude with Sydney’s largest Catholic outdoor Mass, since Pope Benedict XVI was here for World Youth Day in 2008, to be celebrated at The Domain on Saturday 9 December 2017. Catholic Archbishop of Sydney, Most Rev Anthony Fisher OP, has announced the major event, along with the cancellation of all Vigil Masses in the Archdiocese on that date, inviting everyone to participate. Tens of thousands of Catholics are expected to flock to The Domain for the 6.30pm Mass. “ACYF is for young Catholics from Year 9 to aged 30 to come together to celebrate their faith, but we hope people of all ages, along with many families, will join us for this beautiful Mass in the heart of our beautiful city,” said Archbishop Fisher, who spearheaded WYD 2008. “Not since World Youth Day in 2008 when Sydney welcomed hundreds of thousands of pilgrims to a week-long youth festival with the then-pontiff, Pope Benedict XVI, will we have seen so many Catholics come together to celebrate Mass. ACYF attendees will also have their very own official ACYF 2017 App which can be downloaded now from iTunes or the Google Play store to help them plan what to do each day while at the Festival. Speakers, such as the two young men, Lucas Patchett and Nicholas Marchesi, behind ground-breaking charity Orange Sky Australia that offers a free mobile laundry service for the homeless, will be there to meet with and inspire young Australians. Orange Sky will also be joined by speaker and worship leader Emily Wilson and fellow American singer-songwriter Steve Angrisano along with local performers and Church leaders. Triple J Unearthed artist Emma Fradd will perform as well as X Factor contestant, Fr Rob Galea and speaker Sr Hilda Scott, who rose to fame after appearing in the ABC reality television series, The Abbey. Plus, there will be interactive displays, activities and experiences through a multitude of halls. On the afternoon of the final day of the Festival, attendees will enjoy an experience unique to Sydney by making one of three pilgrimages throughout the city, with some young people retracing the footsteps of WYD08 pilgrims walking from Mary MacKillop place in North Sydney and across the Sydney Harbour Bridge. This entry was posted in Uncategorized on November 8, 2017 by ACBC Communications.